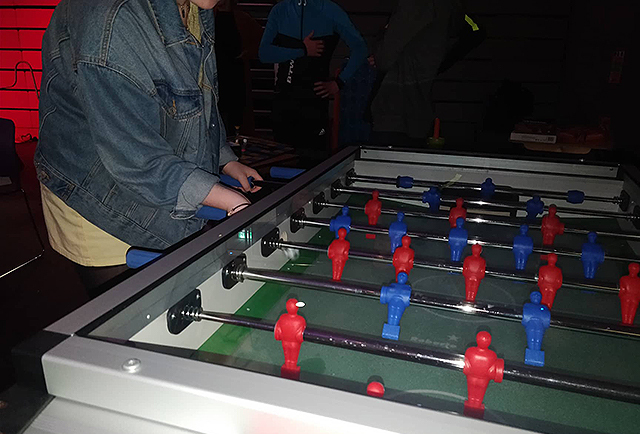 Game Soc teamed up with DCU Volunteer and other civic societies in the university to host a game night aimed at raising funds for the Inner City Helping Homeless (ICHH). Headstarts, Mental Health soc, DCU Free Legal Advice Centre (FLAC) soc and Raising and Giving (Soc) were some of the civic societies that joined the Students’ Union and DCU Volunteer in participating in the event for the advocacy group (ICHH). “The highlight of the event was probably when we lost the very first event on the stage and Antonio got a cream pie to the face which he took like a champ,” said DCU Game soc member Sean Hammond. This is the second time an event like this has taken place in DCU. The first was ‘Bros of Tralee’ which was organised last year by the SU, DCU Volunteer and the civic societies on campus. The event was in aid of the Irish Cancer Society and was a parody on the Rose of Tralee competition. This year’s charitable event saw students from varying societies partake in Twister, Mario Kart, Jenga along with other games while donating to various collection buckets for ICHH on the 27th of March in the U building’s Venue. Donal Corrigan, who is on the Society Life Committee, and Emily McNamara, who ran for Education faculty rep in this years Students’ Union elections, MC’d the event. Various groups and societies were brought on stage to complete challenges throughout the evening. Those who lost were rewarded with a dessert to the face. Game soc usually have their events on a Wednesday night and were contacted by DCU Volunteer to bring down games for the charity fundraiser. DCU Volunteer and the civic society Enactus were also involved with GiveBack.ie in recent weeks which was a Google initiative to help tackle homelessness through using technology. It is not currently known how much money was raised at the Games night for ICHH as DCU Volunteer “have yet to visit ICHH’s office whereby we will calculate the donations with a member of their management in conjunction with fundraising regulations,” said DCU Volunteer Coordinator Ruth Lynam. Lynam said they will know how much was raised by Thursday this week. Although this event was a collaborative one, there have been several other successful fundraising events held by civic societies throughout the year. These include the DCU SVP sleep-out, RAG Rumble by the Raising and Giving Society and the 24 Hour Broadcast by Media Production Society (MPS).